We’re excited to now be offering not only the finest in ice cream sandwiches and sundae desserts, but the finest in ice cream cone flavors as well! FatBoy have pulled out all the stops to make ice cream cones that are some of the best that money can buy. We’ll be covering each of the five new flavors in detail, including Sundae Best, Caramel Praline, Chocolate Fudge Brownie, Cookies N’ Cream, and of course, Cookie Dough! Cookie Dough Ice Cream’s popularity has skyrocketed in recent decades – but you usually find it in gallon containers. Well, we decided to change all of that. When the powers that be and those FatBoy flavor scientists got together to choose flavors for this new line of ice cream cones, they wanted to do things a little differently. In other profiles we’ve outlined some of their out-of-the carton thinking with flavors like Caramel Praline, Cookies N’ Cream, and even Chocolate Fudge Brownie. Who ever thought of coming out with a pre-made Cookie Dough ice cream cone, though? FatBoy, that’s who. 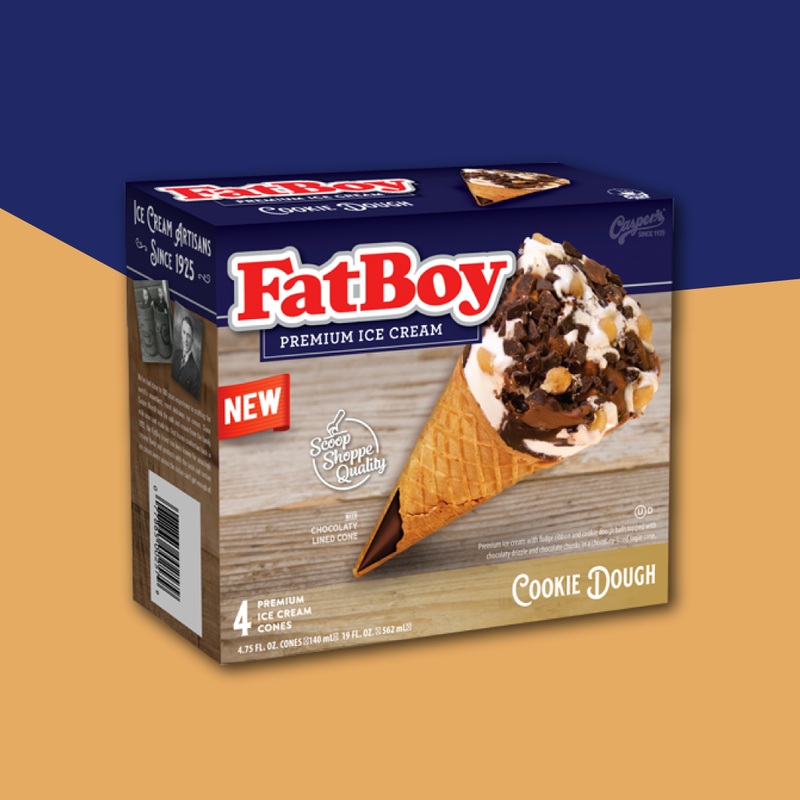 To truly do Cookie Dough justice, we have to talk about the whole cone, and why the flavor geniuses at FatBoy have outdone themselves again. First, we start with scoop-shoppe quality, premium FatBoy Cookie Dough ice cream. We’ll get to what makes that so great in a moment, but first, we need to talk about the rest of the cone. You see, it’s not like going to your local Dan and Harold’s or Basket Starling’s and asking for a cookie dough ice cream cone. You do that, and all you end up with is some fairly good ice cream inside an otherwise unremarkable waffle or sugar cone, and then you’re left to your own devices to top it. Premium Quality, Not Just the Basics! With FatBoy Cookie Dough Ice Cream, we didn’t just leave it at that, because we’re about premium quality, not just the basics. So our Cookie Dough Ice Cream Cones are not just scoop-shoppe quality cookie dough ice cream stuffed inside a regular old waffle cone. Instead, we’ve given you what you’ve come to expect from FatBoy, an incredible amount of flavor value stuffed into an ice cream cone that will have you dreaming about the flavor for days! For us, the cookie dough ice cream was just the beginning. Then we decided to ribbon it with chocolate syrup and add chocolate chunks along with the cookie dough bits that are already generously scattered throughout the vanilla-based ice cream. Okay. That’s enough extras, right? We had to stuff it all into a mouth-watering waffled sugar cone – but not just any old waffled sugar cone – one that was lined with chocolate to add even more explosive flavor to this piece de’ resistance. How Did Cookie Dough and Ice Cream Come Together, anyway? The cookie dough to which we are referring here is of the chocolate chip variety – meaning it’s the dough that’s usually used in chocolate-chip cookies. Well, according to ice cream folklore, it started with those Vermont hippies, Ben and Jerry, who supposedly got the idea from an anonymous suggestion on a flavor suggestion board in their Burlington scoop shoppe. Since the suggestion was anonymous, Ben and Jerry’s is widely credited with creating the flavor. It was introduced in the 1980’s, and by the ‘90s, the flavor had become so popular that the company moved it from the counter to the freezer aisle, where it remains a perennial favorite today. Ben and Jerry’s aren’t the only ones to lay claim to the flavor’s invention, though. Another company, Whitey’s Ice Cream, plainly states on their webpages that they were the first company to use cookie dough as an ingredient. There are many different theories on how to make the perfect cookie dough ice cream. Some say you should be conservative with the cookie dough bits – putting just enough in to add a surprise to every few bites. Others, however, prefer a cookie dough bit in every bite. At FatBoy®, we believe in applying flavor liberally, so cookie dough lovers won’t be disappointed. Typically, the process for making cookie dough ice cream goes like this: First the dough is made (usually with butter, eggs, sugar, flower, baking soda, and vanilla), then rolled out, cut into bite-sized chunks, and refrigerated. While this is going on, the vanilla ice cream is being made, which usually happens by combining half-and-half, heavy cream, vanilla beans, egg yolks, and sugar, heating it up until it resembles something like eggnog. After the mixture is heated to the right consistency, ice is added, and then the cooled mixture is strained before it freezes to remove any excess vanilla bean parts. Once the ice cream is cooled, the pre-cooled cookie dough is mixed in, and it’s ready for packaging! If you’ve ever made chocolate chip cookies from scratch, then you probably know that the best part of that whole process is sneaking a finger-full of that wonderful, gooey, raw cookie dough before the cookies hit the oven. If you’ve never had the pleasure, we weep for you. We also weep for you if you’ve never tried chocolate chip cookie dough ice cream. Fortunately all of this weeping is completely unnecessary. In order to experience chocolate chip cookie dough ice cream to its fullest, you need look no further than your local grocer or wherever FatBoy® Cookie Dough Ice Cream Cones are sold! See you in the freezer FatBoy aisle!